Res Ipsa Loquitur – The Thing Speaks For Itself Res Ipsa Loquitur is a Latin phrase meaning, “the thing speaks for itself.” Much used in common law doctrine and legal jargon. What is interesting though is that such a phrase is not often used in architecture, but should since it can allow in depth thought in different ways. One way I have seen it is by working with many passionately great architects on wonderful projects. One in particular, Kevin Koch, AIA, Architect at the Texas State Preservation Board and project manager for Texas Governor’s Mansion Restoration, has shown that old neglected materials can have a new life. 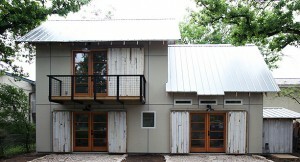 On a project we built for Mr. Koch, his old garage sat where his new art studio was to be constructed. 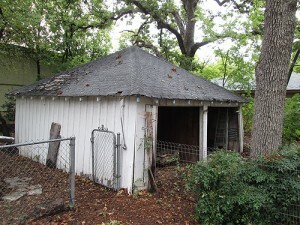 Looking at the garage, you can see wood rot. The first inclination would be to throw everything away, however, the architect was determined to save as much as possible – a complete opposite to the norm. 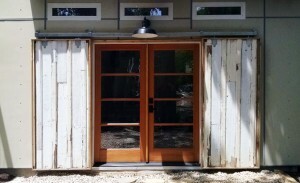 His initial plan was to make barn door sliders out of it with just simple plywood backing and nailing like two dimensional thought (two dimensional thinking is “essentially … not look beyond the moment, to understand only the moment but not the cause and effect.” https://tbrickert.wordpress.com/2010/06/11/two-dimensional-thinking/ ) After the main structure was erected, he knew that it would not be enough to overcome the newness of the sidings so he took the thought to the next level and framed the sidings with exposed members in the back for three dimensional expression. 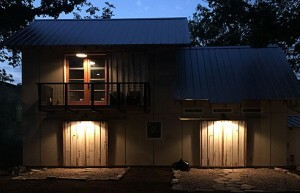 In addition, we used the same old siding and applied them over the structural sheathing and moisture barrier so that a juxtaposition is created for setting the contrast between old and new. Another way of allowing old things to speak was by way of adding the storage shed door from an old house that was being demolished nearby. The front door, together with all the trim, was placed backwards so that it swings out. The trim pieces had to be modified, but all in all, everything looked great for re-adaptive use of same function and form. 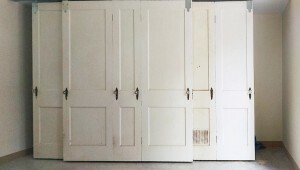 As for the interior doors, Mr. Koch wanted to use the old panel doors to closet sliders. 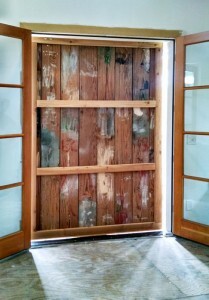 We took all the used doors with the hardware and attached them side by side. 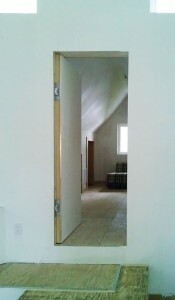 Three seperate panels were formed with the barn door track system guiding them. The fact that no tracks or guides are at the bottom, allows the doors to tilt out giving extra room for over sized objects to be stored in the closet space. This is a very good idea to allow objects that define space to accommodate expansive needs. 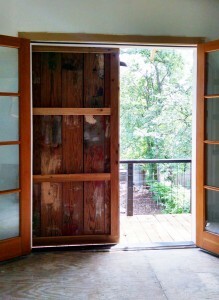 Since the studio was made for art, the architect wanted a door to speak as one with the room. 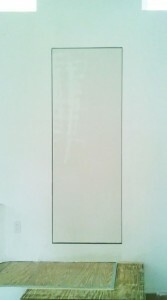 This meant that we made a hidden drywall door that would not have traditional door handle and hinges. The hidden door was built with special hidden hinges and reglet frame that would allow a mural of expressions to be created on the wall with minimal distraction from the door. In my humble opinion, Mies van der Rohe would be proud of this work. In essence, the personal art studio project parallels what Jack Dorsey, co-founder of Twitter and Square, believes in where “principle of simplicity, constraint, and craftsmanship” are what guides the invisible speaking materials to open sounding relevancy. Kevin Koch’s passion and deep love for the forgotten ideas and materials follow this principle, much the way we, as admirers, anticipate hearing the voice to appreciate and cherish again. This entry was posted in Architecture. Bookmark the permalink.